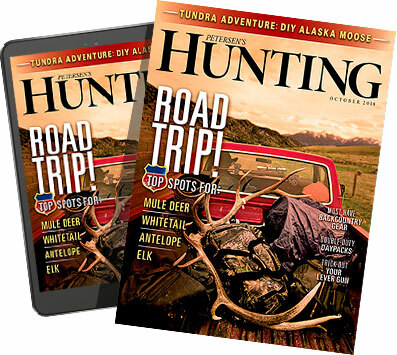 Looking for a quick way to add flavor and moisture to your elk or venison? This tenderloin recipe is it. 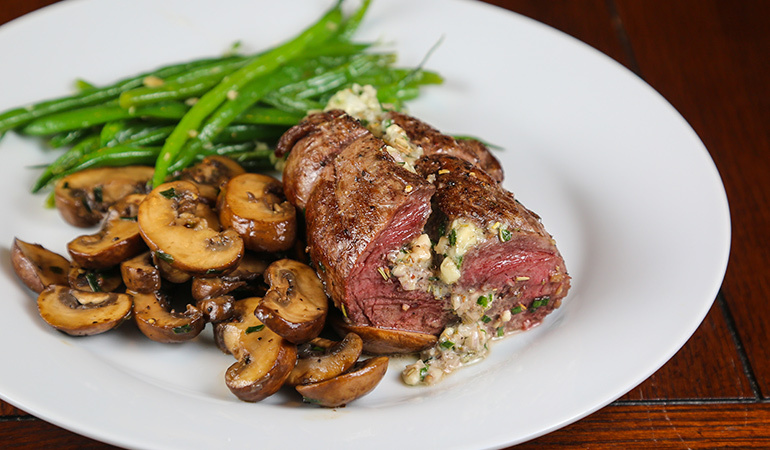 I love the way blue cheese enhances the flavor of steak without overpowering the meat. Sizzling in juicy butter fat coupled with the cheese's nutty, pleasantly stinky and savory taste, this dish will make your mouth water. I highly recommend a softly tannic, fruity red wine with this recipe, such as cabernet sauvignon, merlot, grenache blend, syrah, zinfandel, Bordeaux, petit verdot and malbec. Combine softened butter, blue cheese, shallot, chives, garlic and rosemary. 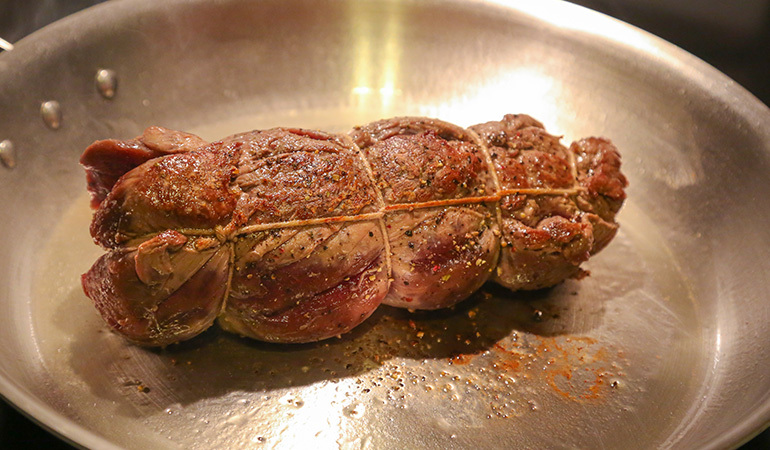 Remove all silver skin from tenderloin and butterfly lengthwise, and then season the inside with salt and pepper. 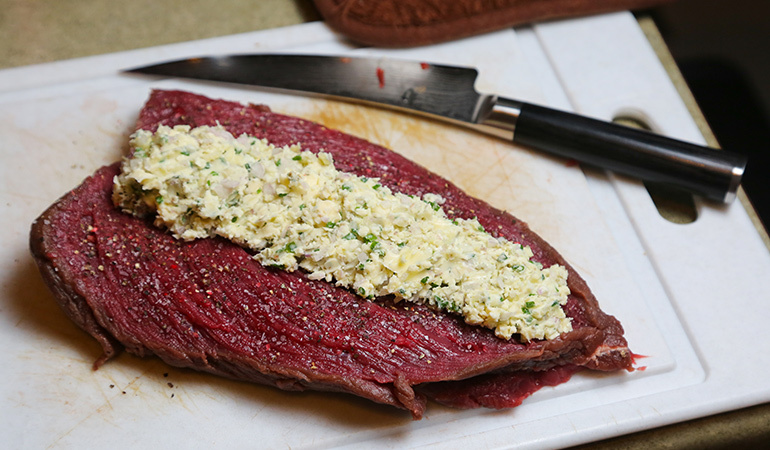 Fill with the blue cheese mixture, roll into a log and secure snugly with cooking twine. Season the outside of loin with salt and pepper. Heat olive oil in a large skillet over medium-high heat. When oil is hot and slightly smoking, quickly sear the tenderloin for a nice crust all around. Transfer browned loin to a rimmed cookie sheet and bake in the oven for about 15 minutes or until internal temperature reaches 130-135 degrees for medium rare. Allow tenderloin to rest for 5 minutes tented in foil. Remove cooking twine and slice to serve.